If you are searching for entertaining moments and odd features in Minecraft world, play The Small Minecraft Game! The author of the game did it on interactive buttons, so players will have new and fresh experiences about a rather new type of game. Thanks to vivid videos and questions, the author seems to succeed in inviting players to participate in the game absolutely. The aim of the game is to explore as much as you can in this world named The Small Minecraft Game, and then report the results and the feelings you have after experiencing a short length of playing time. It is normal if sometimes you have some shocking moments to play some odd games, so just consider it a fun. Furthermore, you can try to compare this game with other games to see whether this small interactive game does have more interesting and creative features than others do. It looks like a small exercise about game field to show how much you have understood the large world of games. You start the game by getting basic materials from a cactus and a tree. Then on hot sand ground, you build a house to keep you safe from potential enemies. Unluckily, you may not have a chance to use it, even when it rains heavily. Then you continue to answer questions in order to keep on exploring the game. You will receive a big surprise by odd ideas of the game. For instance, you will die if you do not collect a cactus. 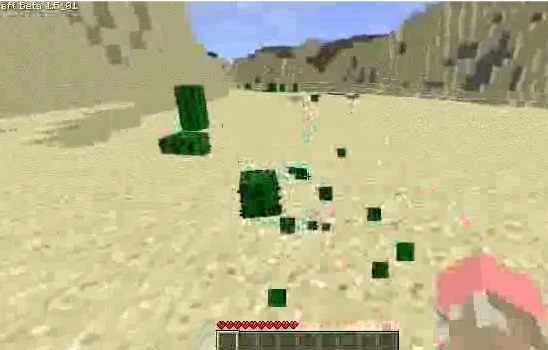 A creeper can appear during daytime and hurt you so much, or the game ends if you stand on wet sand. These odd ideas make fans of Minecraft games shocked totally. Are you ready to have some shocking moments with a Minecraft game that is The Small Minecraft Game? Though it is a small interactive game, it can create some real feelings for players. They seem to exist and move in this world thanks to interactive characteristics. The Small Minecraft Game attracts opposite points of view toward the game. A large number of players have left their comments on the site; they have said that the game is great and creative. However, another large group of players has shown their disappointment because in their opinions the game is poor. Hence, why do not you play and give your own comments? You can share your comments about the features of the game. Some players have contributed creative and useful tips for the author to upgrade the game. By the way, this game is aimed to satisfy entertainment sense, so if you feel entertained, it is enough. You use the mouse to play the game. When questions appear, you click into the option you think it is right. Totally different from other Minecraft games, you do not need WASD or Arrow Keys to move, or craft any weapons to keep yourselves alive. In brief, there are no weapons, recipes, or crafting items.